3-operator FM synth with a focus on different but related ways to create varying timbres. 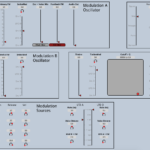 modulation B can be filtered, filter frequency set based on ratio & offset settings. Useful for filtering noise which FMs primary. output (pre filter & vca) can be feedback to FM ModB oscillator. Includes selectable filter option to tame FM behavior. uses standard waveforms from the Kyma default library.